ORANJESTAD - The Dutch Kingdom and Venezuela agreed on Friday to evaluate "new approaches that emerged after the debate" on halting the flow of contraband from the South American country to the neighbouring, so-called ABC islands (Aruba, Bonaire and Curaçao). Talks held in Oranjestad by the Netherlands (also on behalf of Bonaire) and the governments of Aruba and Curaçao with Venezuelan authorities were called "fruitful," but did not result in an immediate end to the trade ban. Venezuela’s Vice-President of Economics Wilmar Castro Soteldo said. "It was a very fruitful meeting with proposals well aligned with the approach that we had brought from Venezuela to the debate table." "It was possible to create a work report that will be submitted to the authorities of both the Netherlands and Venezuela for review so that the corresponding decisions can be made," Soteldo said. Parties agreed to evaluate "new approaches that emerged after the debate" to decide on the next actions to be applied by the Venezuelan government. Among the items discussed were joint work to combat organised crime, as well as the prohibition of tracing merchandise from crime by commercial actors and entrepreneurs of Aruba, Bonaire and Curaçao. 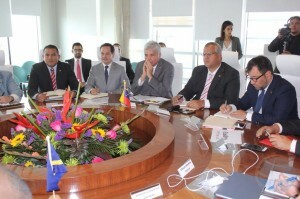 Venezuelan officials presented reasons for closing borders and suspending commercial exchange until the follow-up meeting to achieve a lasting solution. Actions include mandatory compliance with international standards governing trade between countries and requesting a certificate of origin for products entering the country. Host Prime Minister Evelyn Wever-Croes of Aruba said the draft agreement needs to be approved and signed before the situation is normalised. However, the airlines have been allowed to bring some 200 passengers from the islands stuck in Venezuela home. Her Curaçao counterpart Eugene Rhuggenaath hopes the final resolution document can be ratified by the end of this week so the borders can be reopened.